Jane Wheel, gripping the arms of the uncomfortable seat, closed her eyes. The woman in the seat directly in front of her had a lot of blond hair piled up on top of her head secured by purple butterfly clips. Violet cubes and stars dangled from her ears. Jane did not want all of those 21st century plastic accessories to be her last earthly image. She imagined Tim in the seat next to her furiously whispering. Your plane is going down and you want to tell a stranger that a cherry red Bakelite barrette would be more flattering? No. She would not let imaginary Tim distract her from the terror of this dropping plane. He should be here, hysterical and panicky beside her. When he insincerely offered to go with her to visit her brother, why had she not pretended to believe that he really did want to go and grab him and his designer luggage and drag him onto this tiny little toy plane? Jane and Tim had a great enduring friendship—the kind based on real, true honest dishonesty. They faked stuff all the time. Why had she chosen that moment to tell him she appreciated the offer, but knew he’d love a little more time in LA while she went to see Michael and his family? “No,” she whispered out loud. Better to open her eyes, relax her grip, inhale and exhale. Think about good things. Any normal person would conjure their loved ones—son, husband, parents. Jane rejected that thought. Too painful—if she pictured Nick’s grin, Charley’s hands, Don’s wink, Nellie’s grimace—she would be too overcome to remember any survival techniques that might be required. Jane Wheel, girl detective, could review her cases. Ha! Jane Wheel, accidental private eye, finder of dead bodies, spotter of antique forgeries, champion of the innocent…wait, was that Detective Oh’s voice in her ear? Mrs. Wheel, are you not equally a friend of the guilty? No, a review of her professional life was not going to calm her nerves or center her spirit. Jane needed to breathe and block out the roar and rattle of this misfiring engine, and think about something normal. She hardly expected her messy life to flash before her eyes. She doubted that the whole life-flashing clichÈ really happened for anyone. It couldn’t be true, and yet how in the world had it become a clichÈ? Whose life was simple enough, straightforward enough, coherent enough to form itself into a slide show and flash before his or her eyes? And Jane’s life, after adamantly refusing to flash before her eyes, stretched out once again before her. The sheer terror of being inside of a small prop jet being dribbled like a basketball by thermal currents gave way to the everyday annoyance of passengers ignoring the pilot’s admonitions, unfastening seatbelts and rummaging around for their carry-on baggage. When the woman seated in front of her began the sideways wriggling half-stand that signaled her desire to get out first, one of her hairclips fell and landed in Jane’s lap. Since the woman had already made it into the aisle, Jane didn’t bother to call out her loss. Instead, Jane, the magpie, slipped the purple clip into her pocket, bestowing upon it the cache of a good luck charm which meant she would have a difficult time ever ridding herself of it, always remembering how it somehow kept a plane aloft on a breezy California day. She was happy to be alive in this cramped little plane and delighted that she wouldn’t have to hug her seat cushion or breathe normally into a mask or slide down some plastic tube into darkness. Jane simply had to deplane, retrieve her bags and walk into the oppressive dessert heat where she would spend two days with her little brother Michael whom she hadn’t seen in two years. Family. Memories. Old wounds. Bitter arguments. Unexpected joys. The inevitable disappointment of unrealistic expectations. Perhaps this trip was slightly similar to sliding down a chute into the unknown. Scary Stuff. Jane’s niece bent her head down so close to the table where a gold and red stamp lay under a glass dome magnifier. Jane collected bakelite, buttons, sewing tools, measuring tapes, yardsticks, cigar boxes, flower frogs, anything with letters and numbers, kitchenalia, Catholica, old spice jars, maps, ephemera, wedding photos, crocheted potholders, autograph books, high school yearbooks, old fabric, scissors, knitting needles, vintage office supplies, wooden boxes…among other things. When Jane was faced with a row of coins in a glass case or an array of colorful stamps, paper-hinged or never-been-glued—she was befuddled. Collections that were somehow meant to be collections eluded her. She seemed to feel only the pull of the used and worn; the “mib” (mint-in-box), or “uncirculated” designation was one she respected, but did not covet. Q, whose given name “Susan” after a beloved maternal grandmother, had been shortened to Suzie by a former nanny, then further trampled on as “Suzie Q”, by a nursery school teacher, had been thrown out with the bathwater and shortened permanently to Q. It suited her. She twisted her long open face into a question mark as soon as she opened her eyes in the morning. “What does that have to…?” Michael began to ask, folding up the newspaper he had been reading. “I don’t know really. I resist collections that need to be fussed over, maybe?” Jane asked. “Stamps can be valuable, right?” Jane asked. Q. nodded so hard that her blond ponytail bobbed up and down. “That’s it, then. I never collect anything that I actually might make money on,” said Jane. “I only accept poor stuff, old throwaways and cast-offs,” Jane said, picking up a stamp hinge, licking it and sticking it to her niece’s forehead. “Baseball cards?” Jane asked, reaching for a cardboard shirt box in the back of the drawer. “Yeah, I didn’t know where to keep them once the baby was born and I lost my home office. Not that I’m complaining—a nursery is a much better use of the space since I never get any work done when I’m home,” said Michael, laughing and picking up all of 9-month old Jamey’s toys at once by gathering corners of a pale green blanket and holding it hobo style, a elephant rattle still making a faint rain-on-the-roof sound as the bundle swung from Michael’s hand. Jane looked straight at adult Michael, holding his own son’s toys, but only saw little brother, Michael—ten years old– sprawled out on the floor sorting his cards, much like Q had been studying her stamps. Jane remembered their mother Nellie’s complaints about his stuff scattered all over the place. Nellie must have thrown out Michael’s baseball cards. Every mother threw away their son’s baseball cards. It was the rule. It was the very thing, the unforgivable act that made sons leave the homes of their mothers! Lamenting all the things your parents did to you was part of generic adulthood—but the specific crime committed by parents was what they made their kids throw away. 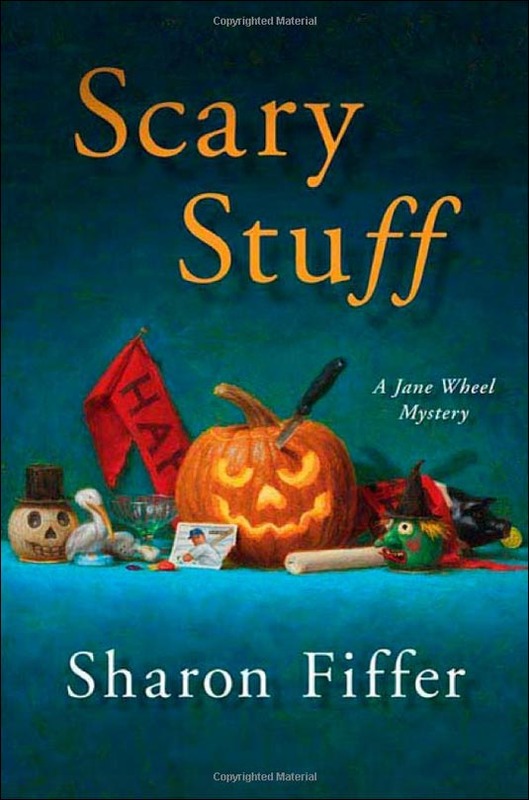 Hopes, dreams, self-esteem—all important enough but what Jane preferred to focus on was the moth-eaten stuffed animals, fractured dolls, scribbled coloring books–the possessions of their offspring that they didn’t value enough to save. Jane, until recently had thought Nellie threw out everything, swept away Jane’s and Michael’s childhoods with a few brisk arcs of her wicked broom, but Jane had been wrong. She had discovered her mother’s secret closet of memories—never mind that those souvenirs weren’t the ones that Jane had really wanted. The whole incident had made Jane rethink what childhood memories amounted to anyway—do they belong to the child or the parent? Both, of course, but whose are the truest? Jane longed for her first rock collection, but Nellie thought her little plaid wool coat and hat from toddlerdom was the relic worth packing into mothballs. Michael laughed and put his hand on top of his sister’s head. Six years younger, six inches taller, he was a handsome confident, successful man. “C’mon, Jane, you know why,” Michael said, half whispering. Jane dressed quickly in a light cashmere skirt and short-sleeved sweater, the only matching outfit she had brought to Michael and Monica’s house. She had traveled light to Los Angles from Chicago, and even lighter from LA to Palm Springs, leaving her large suitcase with Tim Lowry to send home. He was shipping back several boxes of flotsam and jetsam he had picked up at the flea markets and shops in and around Los Angeles for his own business in Illinois. As picker and dealer, Jane and Tim had had a productive trip. Maybe their adventures would not make it to the big screen any time soon, their lives not turned into a movie script as they had been falsely promised, but they had found vintage treasures. Oh yes, and they had successfully caught a murderer. Lured out to LA by a producer who showed interest in turning Jane’s recent PI adventure into a movie, Jane discovered that although Hollywood had its charms, she was far from ready for her close-up. Jane hadn’t wanted that so-called fame and fortune anyway—the satisfaction of settling into her new career, as former police detective Bruce Oh’s partner, now with another case solved—so far away from home, too—was justification enough for her west coast trip. And now she was reconnecting with family; her brother Michael and his lovely wife, Monica, their precocious daughter Q and perfectly adorable baby boy, Jamey, who she was meeting for the first time. Talk about the perfect clichÈ! Michael was a successful lawyer at a large commercial real estate firm, Monica worked part-time as an art therapist, and the children, although spaced slightly farther apart than they had planned, according to Monica, were smart, sweet, perfect—practically ordered from a catalogue. Jane brushed her lashes lightly with mascara and dug around in her purse for a lipstick. Looking in the mirror, she made a face, exaggerating a frown. She didn’t want to be the jealous older sister. She herself had a handsome husband and a darling son. They just might be catalogue-worthy themselves! She had a career. Two careers! She wasn’t just a picker; she wasn’t just a detective. She was Jane Wheel, PPI—Picker and Private Investigator. She had a great adult life, too, damn it. Okay, so Charley, a geology professor, traveled a lot, sometimes seeming to prefer spending weeks at a dig site out of the country to making his way through the maze of boxes and bags of stuff Jane “picked” from estate sales, rummage and flea markets to resell to dealers. And sometimes Nick, a clever and smart middle-schooler seemed to prefer Charley’s digs, discovering dinosaur bones, to Jane’s treasure hunts for Bakelite buttons and McCoy flowerpots. And didn’t Jane choose to live in Evanston? Close to Chicago and close to Kankakee where her best friend Tim lived, where she and Michael had grown up, children of Don and Nellie, owners of the EZ Way Inn? So not only was Jane enmeshed in her own satisfying—in its own way–family life, but she was also close to Don and Nellie—practically a phone call away. Oh, damn it all, Jane thought, trying to coax her frown into a relaxed pout so she could apply lipstick. Not only does Michael have his life figured out, he figured out how to get away from Kankakee, away from the EZ Way Inn, away from Nellie. And, somehow, he even managed to keep his baseball cards. Q, almost ten years old, was thrilled to be going out to dinner with her parents and mysterious Aunt Jane. She had other aunts…her mother had two sisters and both of them lived in California, so Q saw them regularly. They were great and they gave her lovely clothes on her birthday, or the newest toys and games, and Q was always properly grateful. But it was Aunt Jane who sent her the packages wrapped up in brown paper that thrilled her. Sometimes the packages didn’t even arrive on or near a birthday. Aunt Jane would write a note on the back of an old postcard with a picture of a place like Paris or London or Amsterdam or Budapest that Q already wanted to visit someday. Aunt Jane would write, “Shall we visit The Tower of London together? Love, A. J.” and Q would tape the cards up above her bed, imagining a trip with her aunt that would zigzag all over the world. One of Q’s favorite presents from Aunt Jane was an old metal globe. Stuck to its surface was a tiny gray magnetic airplane. With each new postcard, Q would move the plane to the new city to which her Aunt had introduced her. They were going to have fine travels together, she and Aunt Jane. She was so different from her mom who was tall and blond like Q. Aunt Jane was small with short dark hair that she always messed up with both hands when she talked about stuff. She got excited and danced around a lot, too. She wore lipstick, but no high heels even though she was short. Q thought this made her brave somehow. Her other aunts wore high heels and took small steps. Aunt Jane bounced when she walked and seemed like she was always ready to run off and do things. Q was going to be just like her when she grew up. Except she would be taller, and blonde, of course. “Is everybody in this state a natural blonde?” Jane asked, pulling Q’s ponytail and looking around as they were seated at a table in the middle of the large dining room. Jane ordered a Grey Goose with extra olives and Michael, in a whisper, ordered Pinky on the rocks for Monica and himself. “What’s a Pinky?” Jane asked. “Scandinavian vodka—too pretty , too precious, but once you taste it…” said Michael. “He hates to order it, though,” said Monica, laughing. “Will you get oysters, Aunt Jane?” asked Q. The waiter arrived with Jane’s Grey Goose and two pale pink cocktails for Michael and Monica. He also placed a juice concoction with a multi-fruit garnish hanging off the edge for Q.
Jane tried a sip of Monica’s vodka and, in spite of her EZ Way Inn indoctrination against anything trendy, fussy or pastel, she nearly swooned at the delicate hint of strawberries and clean finish of the vodka. As loyal as she was to Grey Goose, she had a feeling she might just have to step out with Pinky now and then, if she could find it in Illinois. She had a feeling this ethereal drink just might be one of those California mirages. Maybe she could find a bottle to bring home to Tim. He had tried to woo her away to Ciroc. Now she would tempt him with Pinky. Jane’s pleasant vodka reverie was interrupted when a group of men emerged from what appeared to be a private dining room opposite their table. They were holding unlit cigars in one hand and cocktails in the other. The waiter was explaining that he was arranging a spot in the garden where they could smoke. “Jane, before they go out there and poison the garden, come with me to see it. It’s one of our favorite spots. You’ll love it, lots of garden antiques and stuff—right up your alley,” Michael said, pushing back his chair and jumping up to hold his sisters chair. “You have lovely manners, Michael. Really, you do,” said Jane. She knew where they came from, too. Despite all their complaining about Kankakee and being raised at the tavern, Jane pretending to hate it and Michael truly disliking the place, they had both learned their manners from Don and Nellie. Something about the customer always being right or respecting their elders or some old world politeness of Don—whatever it was, the two of them had learned to say please and thank you, to listen when people spoke to them and, to hold the door for the elders. Don had always treated Jane like a young lady, holding out her chair for her, taking her heavy bookbag from her when he picked her up from school. Nellie liked pulling out her own chair, carrying her own heavy packages, so Don gave her a wide berth. But with Jane and Michael, the manners had taken hold. Just as Jane was about to ask Michael about his last conversation with their parents, one of the cigar smokers approached them. Listing to the right, Jane wasn’t sure whether he had too much to drink or whether he was just physically and perhaps permanently off balance. The stranger stepped back and stared directly at Michael, ignoring Jane who was rocking back and forth on the balls of her feet, readying herself for a fight. Michael might be taller, but he was younger and if she had to protect him, she would. “What the hell was that?” said Jane, watching the man return to his buddies and light up his cigar. “I don’t honestly know, but that’s the third time it’s happened. Six months ago, I was in Columbus, Ohio for a conference and a guy comes up and shoves me into a table and says he’s going to rearrange my face for breaking his wife’s heart. Monica was with me…first time she had left the baby overnight. I had begged her to come for the weekend, just a little break for us. And this freaked her out so badly she almost flew home that night. The guy apologized, said he believed me I wasn’t the guy, but that I looked just like this crook. I wanted to ask him about it, but Monica was crying and by the time I got her calmed down, the guy was gone. “I’m so glad you finally came out here, Jane,” Michael said, giving her a quick hug. Jane did go to the ladies room. She applied fresh lipstick and ran a hand through her hair. Then she returned to the garden and approached the cigar smokers, hoping that the skirt and sweater that Tim had selected as her dress-up LA outfit was as “hot” as Tim assured her it was. Jane knew that “hot” at her age probably translated to tepid at best, but she didn’t care. She just wanted to make a favorable impression on the man who had threatened her brother. “Excuse me, may I have a word?” Jane asked. “Change your mind about the drink?” he asked, stepping away from his companions, blowing a smoke ring. Jane felt the man steaming up as he spoke of the incident. “Why?” Jane asked, shrugging away the hand he rested on her shoulder. The lack of balance she had noticed before she now saw was directly related to drinking. He was beginning to slur his words. “What town?” asked Jane, holding her breath for the answer. His friend gave him a wave from the parking lot, but Jane blocked his view, then put her hand on his shoulder and turned him toward her.. He reached into his pocket and pulled out a business card and gave it to Jane. The light was dim in the garden, but Jane could make out that he was a general contractor. He put his hand over his mouth and shook his head. “Don’t tell those guys, okay?” He leaned in close enough for Jane to smell the last whiskey sour he had downed. Jane crossed her heart and sealed her lips.